The Houston Texans’ quarterback Tom Savage could be seen shaking on the field after taking a tough hit from 49ers defensive end Elvis Dumervil. Savage returned to the field just minutes later despite the hit, but was later removed from the game due to a concussion. Savage’s return drew criticism from fans and experts alike. 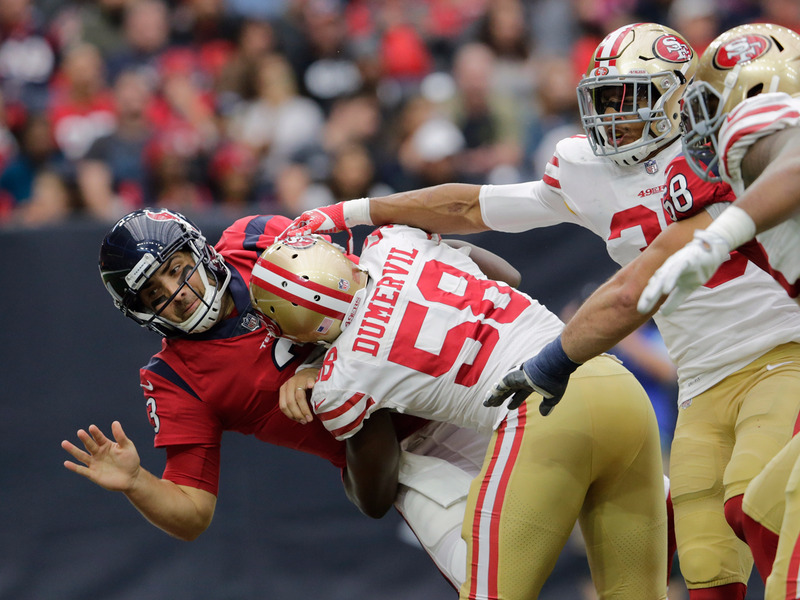 The quick re-entry of Houston Texans’ quarterback Tom Savage after a scary hit against the San Francisco 49ers on Sunday, led to more questions about the enforcement of the NFL’s concussion protocol. Pinned against his own end zone, Savage dropped back and was decked by 49ers defensive end Elvis Dumervil. Savage remained on the ground for a while after the hit, with his hands visibly shaking, before eventually being helped up. You can see the scary moment below. After the hit, Savage went to the team medical tent for less than three minutes, before returning to the game for the Texans’ next series. Savage stayed in the game for the three-play series and went back to the sideline. A series later, Savage tried to take the field again, but was stopped by a team official and led back to the locker room by a trainer. Across Twitter, many shared their horror with Savage’s return to the field. As Sarah Barshop at ESPN noted, Savage’s initial return to the field caught the attention of Chris Nowinski, the founding CEO of the Concussion Legacy Foundation and co-director of Boston University’s Center for the Study of Traumatic Encephalopathy, who was obviously disheartened by the move. Savage was replaced by T.J. Yates, who led the Texans to a touchdown on his first drive under center, but Houston would in the end fall to the 49ers by a final score of 26-16.